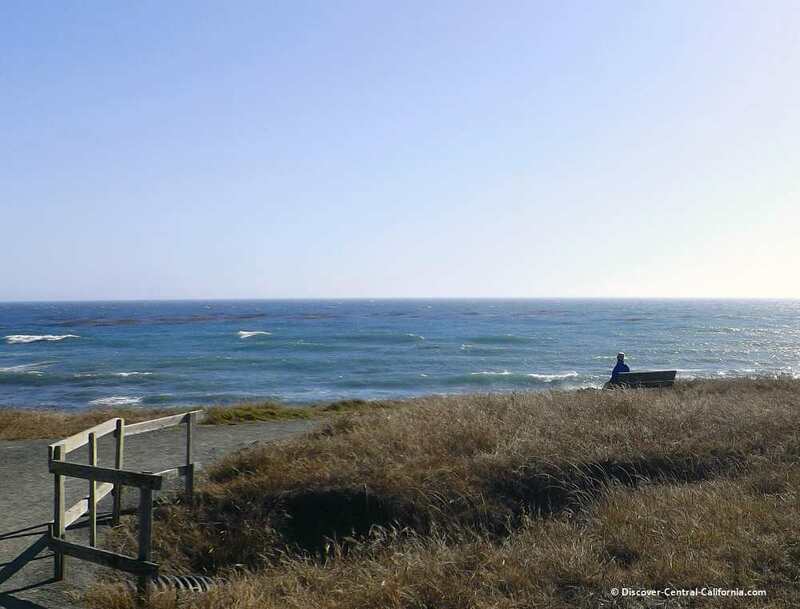 Moonstone Beach at the north end of Cambria is a great place for a picnic at the beach and just to spend some time relaxing. This is our "go to" beach. We've never been disappointed here. 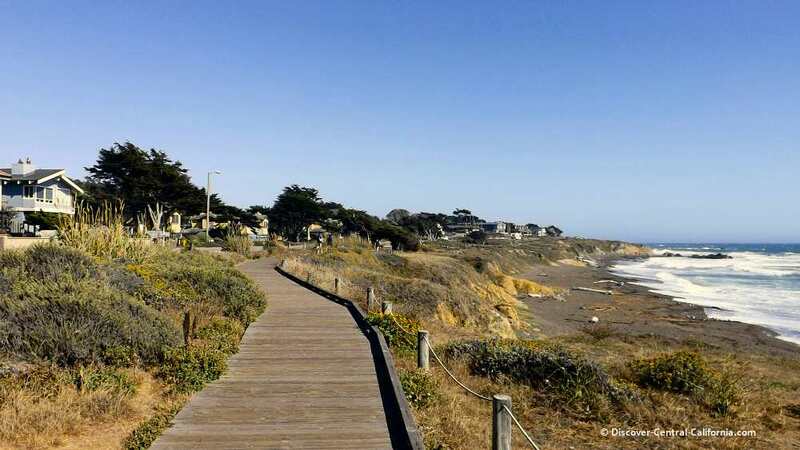 There is a very well-built boardwalk that just about parallels the length of Moonstone Beach Drive and provides a pleasant walk just above the beach with several scenic overlooks. There are a number of benches along the way if you need to rest at some point and the boardwalk itself is easy on the feet and legs. 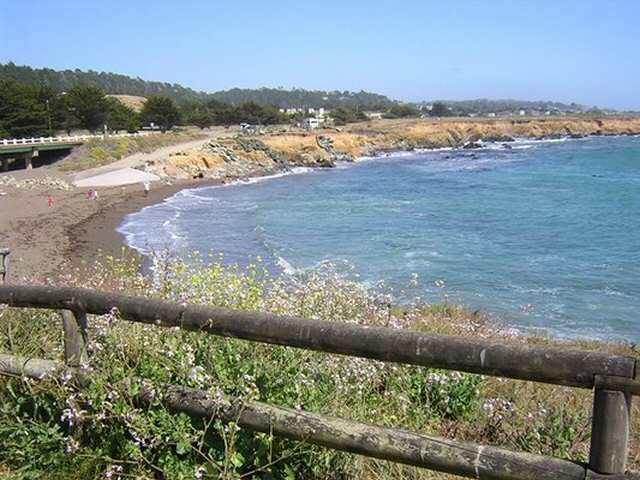 At the north end of Moonstone is Leffingwell Landing, a part of San Simeon State Park. It is a day-use area (no charge) with a number of picnic tables and BBQ grills as well as restrooms. There is a lovely little cove down the short bluff from the picnic area. At low tide, it is a good place for tidepooling. Be sure to bring folding chairs so you can sit and watch the surf, the pelicans and the otters after enjoying your picnic. Binoculars are good as well. And don't forget to layer your clothing as this site can get fairly windy and cool. It can get quite foggy here as well, but on those occasions we just sit in our car at one of the parking lots at either end of Moonstone Beach Drive and watch the surf from there. 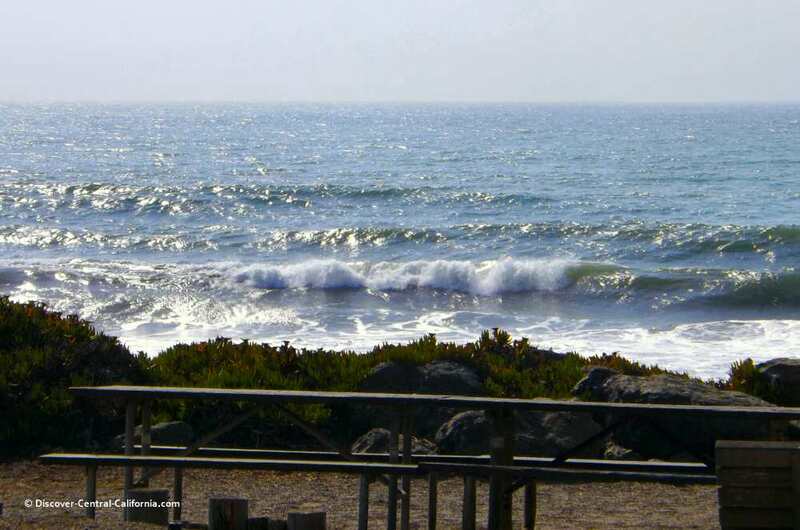 Shamel Park, also in Cambria, is another great place for a beach picnic. Shamel is a lovely county park that is set in a quiet residential neighborhood. It is easy to find but most visitors to Cambria don't find it since there are no commercial services down Windsor Blvd. Directions to Shamel Park: If you are driving through Cambria on Main Street, its northerly end merges with Highway 1 at a traffic light. Across Highway 1 is Windsor Blvd. Almost immediately after crossing the highway is the intersection with Moonstone Drive. If you pass this intersection and keep going most straightforward, you will be on Windsor. Just follow that about 1/4 mile, Windsor loops to the left and Shamel Park will be right in front of you. There is a large grassy area here, shaded picnic tables, a lovely playground for the kids and of course, the beach. If you are looking to walk off your lunch, continuing down Windsor will bring you to the Fiscalini Ranch Preserve. This is nearly 500 acres of oceanfront bluffs with native plants and wildlife and accessible walking trails. 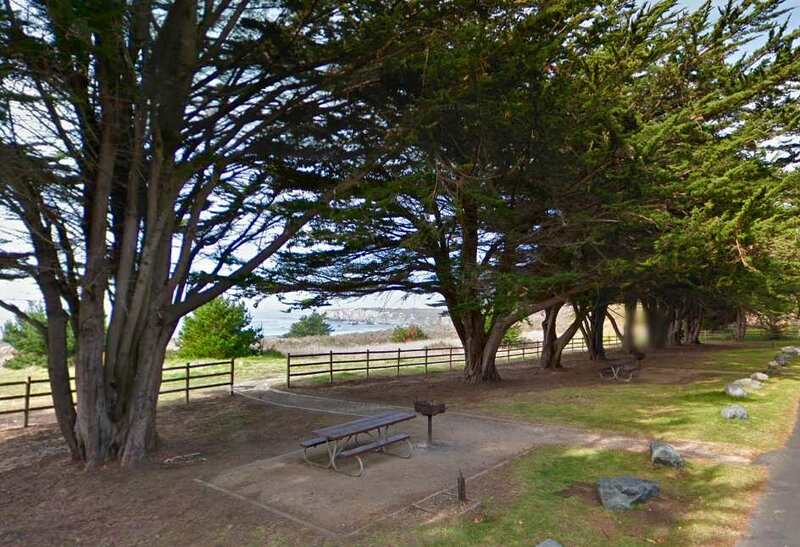 Also in Cambria, and harder still to find, is Lampton Cliffs Park. It is worth looking for, however as you can enjoy the ocean without crowds. There really aren't any picnic facilities here. But you can enjoy a pre-packed meal on the lone bench that is shown above. So if you want the whole "tailgating at the beach" experience, this isn't the place. But if you really need some quiet time, do search this one out. Lovers Point Park and Beach has the traditional picnic facilities along with a host of other "Fun at the Beach" activities. 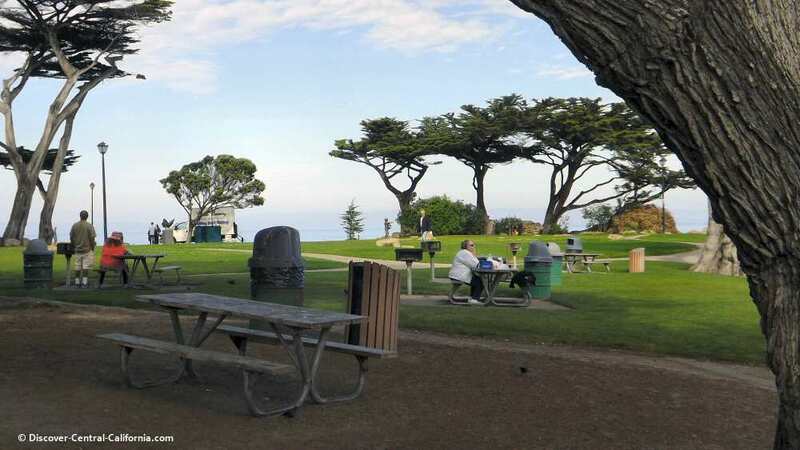 Easy parking, easy to find with good, accessible facilities - this is a winner among beach picnic areas in the Monterey area. Lovers Point is only a mile or so from the Monterey Bay Aquarium and has lots of parking, including oversized if you are driving an RV. A good choice in Pacific Grove. Technically, this shouldn't be included in the "beach picnic" category since you really can't see the ocean from this picnic area. But it's so darn close you can hear it and smell it, so we're including it here. You can walk to the ocean from this lovely park on the north side of Morro Bay on some nice boardwalks. And Morro Rock will keep you from getting lost. 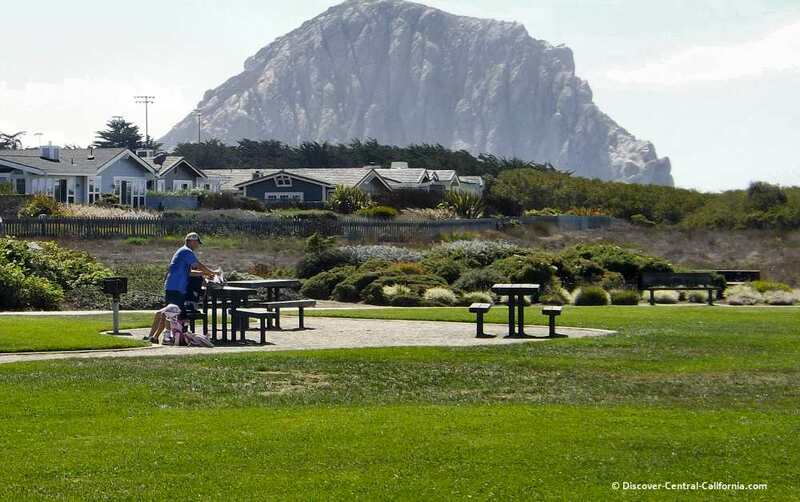 The Cloisters Park is easily accessible from Highway 1 just north of the town of Morro Bay. The Big Sur area is famed for the drama of mountains precipitously dropping their feet right into the ocean. And for the most part, that accurately describes the 90 mile drive that is famed the world over. However, there are a few areas where there is a marine terrace which allows for more than just the roadway desperately clinging to the hillside. Sand Dollar Beach in Plaskett is one of these places where a welcome respite can be enjoyed. There is a day use area with ample parking, picnic tables, BBQ grills, and restrooms. The GPS coordinates for this place are 35.920937, -121.466586. 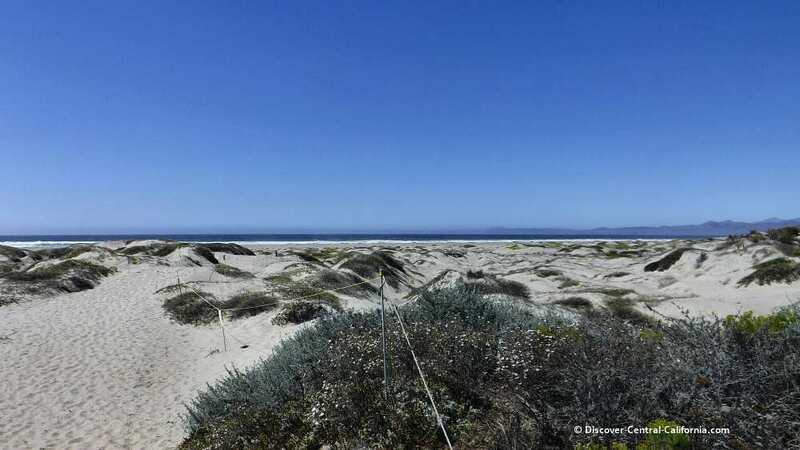 It is located just a quarter mile north of the Plaskett Creek Campgrounds near mile marker 14.00 for Monterey County. As you can see in the above photo, there is a trail which leads down to Sand Dollar Beach proper. This is one of the longest stretches of sand among the beaches of Big Sur. Unfortunately, the beach itself is not wheelchair accessible as there is a stairs which leads down to the beach from the bluff. More information about this area here.